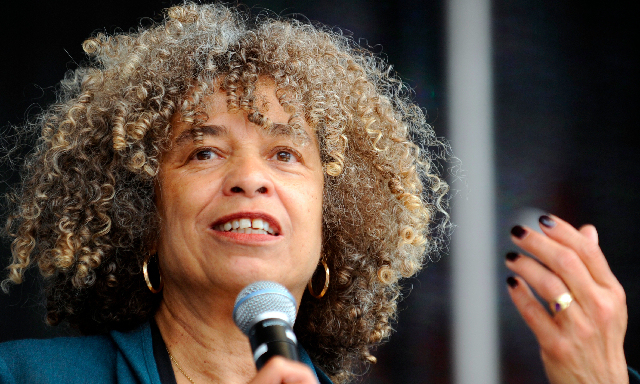 A radical Black activist, author and academic, Angela Davis received a B.A. from Brandeis University in 1965. She later studied as a doctoral candidate at the University of California, San Diego, under the Marxist professor and ‘One Dimensional Man’ (1964) author Herbert Marcuse. Davis joined the Communist Party in 1968, and like many Blacks during the late 1960s, suffered discrimination for her personal political beliefs and commitment to revolutionary ideals. Despite her qualifications and excellent teaching record, the California Board of Regents refused to renew her appointment as a philosophy lecturer in 1970. Davis worked to free the Soledad (Prison) Brothers, African-American prisoners held in California during the late 1960s. She befriended George Jackson, one of the prisoners. On August 7, 1970, during an abortive escape attempt from Marin County’s Hall of Justice, the trial judge and three people were killed, including George Jackson’s brother Jonathan. Davis was implicated when police claimed that the guns used had been registered in her name. Davis fled and was consequently listed on the FBI’s Top 10 Most Wanted list, sparking one of the most intensive manhunts in recent American history. California Governor Ronald Reagan publicly vowed that Davis would never teach in that state again. In August 1970 she was captured & imprisoned in New York City but was freed eighteen months later, cleared of all charges in 1972 by an all white jury. Her co-defendant and sole-survivor of the Marin Courthouse Rebellion, Ruchell Magee, still remains in prison. Today, she teaches at UC Santa Cruz as a Professor in the History of Consciousness and Feminist Studies Departments. She co-founded Critical Resistance, a national prison abolitionist group, and has written numerous books on race, women and prisons. Since 1984 more than twenty new prisons have opened in California, while only one new campus was added to the California State University system and none to the University of California system. In 1996-97, higher education received only 8.7 percent of the State’s General Fund while corrections received 9.6 percent. Now that affirmative action has been declared illegal in California, it is obvious that education is increasingly reserved for certain people, while prisons are reserved for others. Five times as many black men are presently in prison as in four-year colleges and universities. This new segregation has dangerous implications for the entire country.